CFSSC is one of 48 Family Service agencies throughout the province represented by Family Service Ontario. Together, we serve more than 250,000 Ontarians with mental health, trauma, and addiction challenges each year. 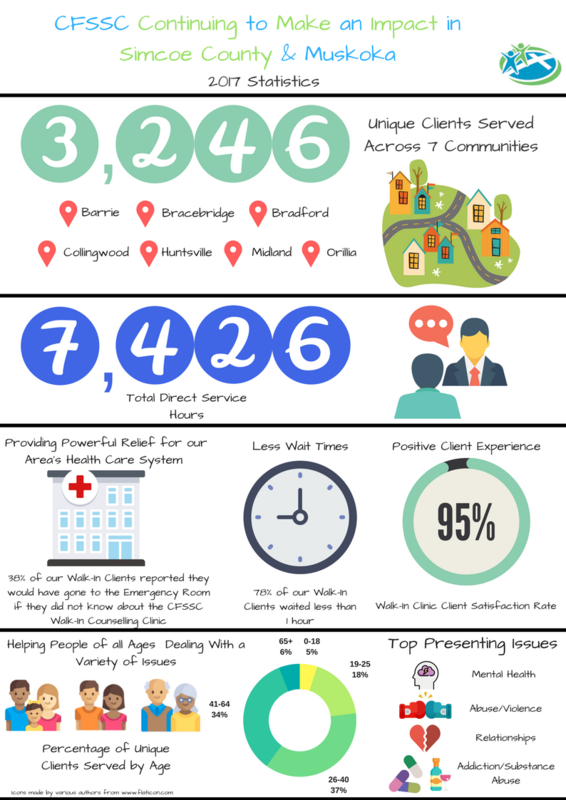 In 2017, CFSSC served 3,246 unique clients throughout Simcoe County and Muskoka. That represents over 7,426 hours of direct service to individuals, couples, and community families who rely on us for help. CFSSC provides powerful relief for our area’s health care system by redirecting people in crisis away from hospitals and into effective community-based treatment. CFSSC provides FREE Walk- In Counselling services in several locations throughout Simcoe County and Muskoka (including – Barrie, Collingwood, Orillia, Midland, Bracebridge, and Huntsville. CFSSC Walk-In Counselling Clinics make a difference in the lives of those living and working in Simcoe County and Muskoka! High attendance rates: In 2017, 1,624 clients attended CFSSC Walk-in Counselling clinics. An average of 18 new clients access the CFSSC Barrie clinic on a weekly basis. Nowhere else to turn: 37% of CFSSC clients reported not knowing of any other service they could access for help. Overburdened Healthcare system: 38% of CFSSC clients reported that they would have tried to get an appointment with their busy family doctor or go to an Emergency Department if not for the CFSSC clinic. Less wait time: 78% of CFSSC clients waited less than an hour for counselling at a clinic. High-quality service delivery and positive experiences: CFSSC clients reported a service satisfaction rate of 95%. Improved Stress Levels: 50% CFSSC clients felt their stress was more manageable after a one-hour session. More Hope: CFSSC clients reported increased hope after attending a walk-in counselling session because they feel more knowledgeable about community resources, less stressed about their issue and more empowered to make changes. If you believe in your community and want to help, please consider donating to the CFSSC today.